Our acoustic guitar song based lessons unpack the chord shapes, strumming and picking patterns from an acoustic guitar part taken from our Worship Backing Band MultiTrack recordings. Once you’ve learned the techniques, we build each play-through section into the full-length acoustic part together with the backing track that you can play from beginning to end. The difficulty level is highlighted within each lesson and broadly goes from Beginner-Plus to Intermediate-Plus. Most of the chord and strumming based parts are at the Beginner-Plus to Intermediate level with a few songs with more complex finger picking patterns aimed at the Intermediate to Intermediate-Plus level. This means you’ll be able to play each part if you follow the lesson closely but will have much more understanding of the techniques used if you’ve worked through those courses. Each of our Song Based Lessons comes with a free No Lyric Chord Chart to help you while you learn the song. If you would prefer you can also purchase the full version of the EveryKey Chord Chart. The missing link between chord charts and lead sheets, all for non music readers! (Due to licensing restrictions we are not permitted to provide full lyric chord charts free-of-charge.) 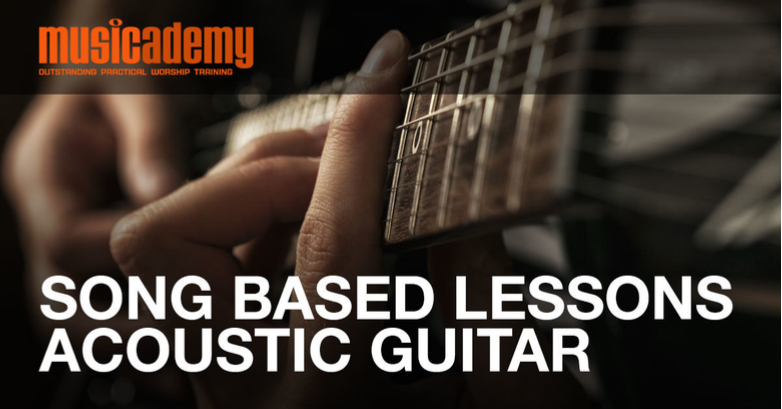 We will be adding a new Electric, Acoustic or Bass Guitar Song Based Lesson each week for the foreseeable future.